One question I get asked a lot is, “How do bloggers make money?” It’s a good question because blogs offer their content for free, so how do you make money on free? Here is the stripped down basics to making money as a blogger. 1) Choose a blog topic that you enjoy and can write lots and lots about. Blogging takes time, so you need to choose a topic that has many different areas you can write about, but also, that you won’t get bored with too easily. The frequency of blogging will depend some on your blog topic, but ideally, you want to have new content often so that people have a reason to return to your blog. The average recommendation is at least 3 articles a week. If you do that every week for as long as you want to make money blogging, you’re looking a 156 articles a year (3 articles a week X 52 weeks = 156 articles a year). While can you re-publish or re-purpose old posts, you can see that you’ll need a lot of content. When blogging for money, consider choosing a sub-topic or niche, as they tend to do better than general blogs. For example, instead of blogging about gardening, blog about organic gardening. 2) Choose a blog topic other people want to know about. Enjoying the topic (#1) is important, but if your goal is making money as a blogger, you need to have a topic other people want to read about. You only make money blogging if you have readers. You can only get readers if you provide information or entertainment they want. You can use a service like SEO Book Keyword Tool to find out how many searches (and therefore how many people want information) there have been on the keywords related to your topic. A keyword tool will also give alternative keyword phrases that can help you pick a niche, as well as give you topics to write about. The most successful bloggers host their own blogs instead of using a free service like Blogger or WordPress.com. The majority of people making money as a blogger use the WordPress script (from WordPress.org, different from the .com version). To do that, you’ll need a domain name and web hosting. I use Godaddy for all my domains, and Momwebs for hosting. For less than $60 you can have a year of domain name and hosting through these options, but any host with cPanel has a free click-n-install WordPress option. Here’s WAHS’s free step-by-step information on setting up a WordPress blog. 4) Focus on content and engagement first. Money is made by having readers. To get readers you need content they want to read. And you keep them coming back by engaging them through an email list and social networking. So as you build your blog (#3) focus on quality content, building an email list, and social networking where your markets connects. I have used Aweber for email marketing for many years, but have recently moved to Convertkit because it’s bells and whistles for bloggers are a bit easier to use. Get your message to them. That doesn’t mean you have bombard everyone with “come see my blog.” In social networks you can share a recent post or answer someone’s question. You can re-purpose an article and add a blurb about your blog at the end, then give it to other blogs or websites to post. By publishing your article on their sites, you can additional exposure and hopefully visitors. 6) Monetize when you have readers. You can monetize earlier, but you won’t make money without readers. The fastest way to monetize is through Google’s Adsense program, which is free and has easy requirements for joining. Be sure to read the rules, because if you break them, Google will boot you out of the program and never let you back in Media.net is another ad feed option for beginning bloggers. Other ways to make money from your blog are to promote other business’ products or services through affiliate programs. For example, Amazon probably has organic gardening books and tools you can promote on an organic gardening blog. ClickBank – Lots of great digital products, but buy the item first to insure it’s good. Conversant (formally Commission Junction) – Many big-name companies use Conversant to manage their affiliate programs. LinkShare – Lots of great affiliate products and services. Shareasale – Lots of great affiliate products and services. You can also sell your own ad space and/or create your own products or a service to sell. In the end, how you monetize your blog doesn’t matter if no one is coming to read it. To do that, it takes planning, work and time. Any guru that tells you otherwise is trying to sell you something. There is no automatic traffic or income from blogging. To be successful you need to provide good content and have readers. As long as you focus on developing those two, you’ll have a good chance of success. 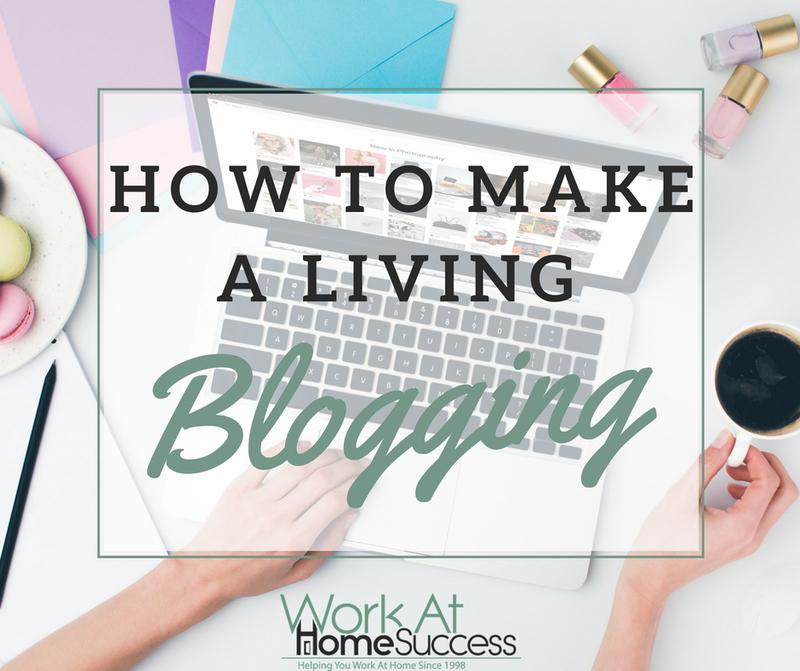 What tips do you have for making a living blogging? Get the Work At Home Job Blueprint FREE and apply to jobs today! Plus get new job listings by email each week. Work-At-Home Success contains advertising as well as screened work-at-home jobs and resources. Some posts may contain affiliate links, which means I may receive compensation if you register or buy using the link.